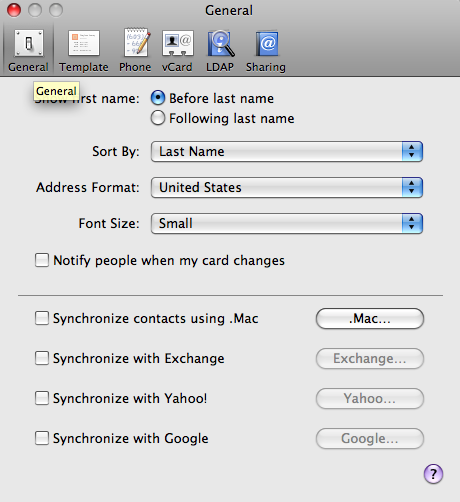 I was excited by the recent update to Apple’s own Address Book application that revealed a “sync with Google” option– albeit only if you happen to have connected an iPod touch or iPhone to that computer. Unfortunately, the offering is less than transparent. It’s unclear, for example, how to initiate a sync with Google. The instructions seem to suggest that it will happen the next time iSync is used to sync your devices– but iPhones and iPod Touches don’t use iSync (at least, not obviously). They’re managed through the iTunes interface, and no where in the iTunes interface is there a mention of Google syncing. Additionally, there doesn’t seem to be any ability to control the granularity of data pushed to Google; it’s an all or nothing proposition. So, if you’ve got account numbers, passwords (not recommended), or personal details about individuals (sammy likes milk before bedtime), all of that information is going to get pushed out to Google. Given this constraint, I’m sorry to say that Address Book’s Google sync option has to be a “nothing” choice for me right now. I’ve got too much data in my contacts list that I don’t trust Google (or anyone else) with.